I hope everyone had a fabulous Easter. We are in the midst of packing for our move. I'm frantically trying to finish up my Etsy orders before the move and get my scrapbooking supplies packed up and ready to go. Phew! I'm sure glad we don't move very often. Anyway it's time for the next Crafting with Kids Challenge. With Mother's day about a month away I decided it's time to make something for Mom. Feel free to use whatever crafting things you'd like: paper, felt, paint, icing, fabric, etc. 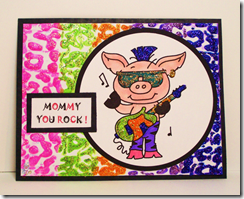 Get crafting with your kids and post a picture of what they created just for you. Here are some ideas from my challenge sponsor - Bugaboo Digi Stamps. You have until Sunday, April 22nd to link up your design below. I'll randomly draw a winner who will recieve 6 free digi images from our sponsor Bugaboo Digi Stamps. Fabulous!! So glad you stopped by! I look forward to seeing the project! Just need to do my blog post....got some good ideas from Pinterest!! !